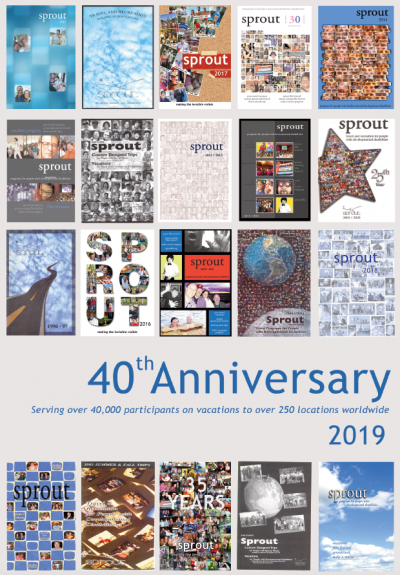 View a digital copy of Sprout’s vacation brochure. Click here or on the image below to view the full screen 30-page brochure. Click here to send us an email with your address if you would like to receive a hard copy of the vacation brochure. Click below to to learn more about the application process! Since 1979, Sprout’s travel program is dedicated to helping individuals with intellectual and developmental disabilities grow through challenging and safe travel experiences and social activities. Operating close to one hundred domestic and international trips every year, Sprout provides its participants an array of travel opportunities in the company of their peers and with the supervision and support of our exceptional Sprout Leaders. We offer a wide array of trip options including ever-popular destinations like Lake George, Cape Cod, Atlantic City, Orlando, Virginia Beach and Washington D.C; special theme trips have included Baseball Hall Of Fame, Amusement Parks trip and Cruises. Through the years, Sprout has offered international travel to cities in Germany, Italy, France, Spain, the Netherlands, Mexico and many other exciting destinations. In addition to selecting trips listed in our annual vacation brochure, Sprout also offers a Custom Design Program for agencies to tailor a trip to the specific needs and interests of their group. It is the perfect way to accommodate the schedule, enhanced care requirements and budgetary concerns for your travelers. You can select the dates, length of trip and destination – and we will arrange the rest! Contact us today for more information or for a trip proposal. My brother is a frequent vacationer thanks to Sprout. He thoroughly looks forward to and enjoys every trip he has gone on. Thanks for creating these experiences for him and the others who could not do this on their own. You can be very proud of your programs and staff. It is very easy to distinguish between those people that are truly dedicated and care about their clients, and those who do not. Many thanks for providing our consumers with a memorable custom-designed vacations. Whenever a group of individuals return from a vacation they are all grinning from ear to ear totally at ease and completely bonded. Thanks to Sprout’s dynamic and felixble program, consumers who normally could not travel were able to do so this year with outstanding results. Due to the energetic, caring Sprout staff, consumers return home with memories of happy times, acceptance and new friends made.